What makes BNZ a Small Business winner? Every year CANSTAR puts financial institutions’ business offerings under the microscope to identify levels of excellence and ultimately announce the winner of the Bank of the Year – Small Business Award. Scoring what banks offer this vital sector of the community is complex. Naturally, we look at the range of dedicated products – such as transaction and savings accounts, credit cards and loans – but we also scrutinize the features a bank offers to help small business every step of the way. A great deal depends on how easy the product is to use in relation to the way your business operates, and the amount of support offered by your financial institution can be a deal breaker. This year, in what is a phenomenal achievement, Bank of New Zealand (BNZ) has proved its enduring commitment to helping small business customers by being named Bank of the Year – Small Business by CANSTAR for the fifth successive year. What makes BNZ a winner? A strong product suite and competitive institutional factors saw BNZ rank highest overall. Taking out the top spot in our Bank of the Year – Small Business comparison were BNZ’s transaction and savings accounts. They are price leaders with their MyMoney for Business account. An added sweetener with this account is that, at time of writing, it offers the lowest average monthly cost of $5 for unlimited transactions. BNZ’s credit cards are very strong, despite the fact that their GlobalPlus business credit card is no longer offered to new customers. With an interest rate of 14.95% for their Business First Visa Lite card, BNZ’s credit card offering is a great option for business owners. (Check current rates on the BNZ website). What business credit cards earn Airpoints? It’s hard to go past BNZ’s overdraft facility. Once again, it ranked highly due to its flexibility. It has no fixed term and 24-hour access at ATMs or online. Loan purpose is not an issue and lump sum repayments are not penalised. Small Business Managers are available 60 hours a week to businesses of all shapes and sizes. With BNZ having 178 branches across the North and South islands, it makes for a healthy ratio of 1.6 branches per Small Business Manager. For extra convenience, video conferencing is also offered with relationship, product and insurance managers. We liked the fact that BNZ encourages start-up businesses by waiving loan application fees on small business packages. These include a discounted overdraft, transaction account, business credit card, term loan and online banking. BNZ also offers the latest in payment technology. Its PayClip attaches to a smart phone or tablet to process credit and debit card transactions online. Eftpos can be used, as well as inserting, swiping or tapping Visa and Mastercards. 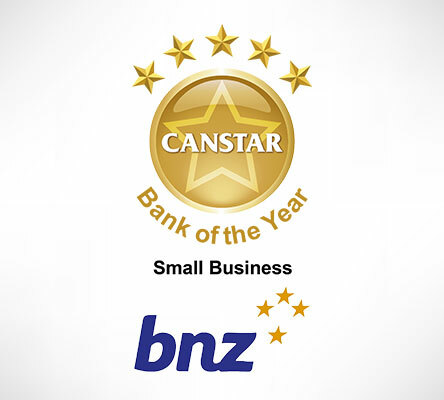 CANSTAR congratulates BNZ for its outstanding achievement in winning the top gong for Small Business in New Zealand.